The Nanshan District—the garden district of Shenzhen—has just under 1 million people, living southwest of the Shenzhen Special Economic Zone. This clean and green district is a favourite with the expatriate community. The district is close to the ferry terminal, getting you to Hong Kong in 45 minutes. Three international schools have set up campus here: the International School of Sino-Canada, Quality Schools International, and Shekou International School. All use English and follow an American-style curriculum. 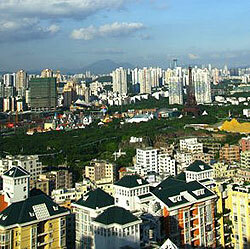 Nanshan is a base for the technology, tourism and distribution industries, and has a large industrial park. Many streets in Western Nanshan are strictly for office use.